To browse: The repository is home to various types of digital content, such as: audio, video, theses, scrapbooks, exhibition ephemera, and much more. The repository is organized by collections. You can find content by browsing through each specific collection. 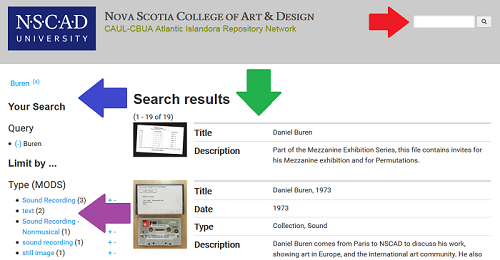 To search: Click on the search bar and type search terms in the search bar and press enter, These terms could be artist/creator, artistic mediums, faculty names, dates, or format of material you are looking for (audio, image, text, etc.). Your search results appear in a list and list title, artist, date, and description. To search the catalogue for an item that may include one or more terms, include OR in uppercase letters between search terms to give results that include one term or the other. Include AND in uppercase to give results that include both terms. You can further expand your results by using a wildcard search. Use a question mark (?) in place of a single letter, or an asterisk (*) in place of more than one letter. art? will search for the terms arts artistic, art, etc. wom*n will search for woman, women, etc. photo? will give you results for the term photo, photography, photographic, photon, etc. Include NOT in uppercase letters to give results of the first term, and want to remove results of the second. You can click on the content type to limit or alter your search results by a specific type of content on the list to the left of your search results.